The first and the foremost point to rewire the brain is to balance and control our blood sugar levels. When the blood sugar is either high or low, it ignites food cravings. Biologically, the human brain can be said to be wired in a way, so as to desire for high-calories as well as fatty foods. Since the brain is driven to look for these kinds of foods, it does not mean that one cannot control the lure for such specific foods. However, if we can train our brain to help control our food urges, then we can be better focused and try to attain the desired weight loss. The desire of the brain to eat as much as it wants and even more than is required is a phenomenon that began from the days of the early man. Eating as much calories whenever possible, helped our ancestors meet their dry ‘hunger’ periods. We have since moved away from this approach, but people are still turning fat and sick due to overeating. The first and the foremost point to rewire the brain is to balance and control our blood sugar levels. When the blood sugar is either high or low, it ignites food cravings. When one gets tired in between meals and feels dull, then it is a sign of that blood sugar is dropping. As the level of the blood sugar diminishes, the person tends to eat more. To balance the blood sugar, one can opt to eat small meals or snacks, like seeds or nuts, which are filled with proteins, every 3 to 4 hours. 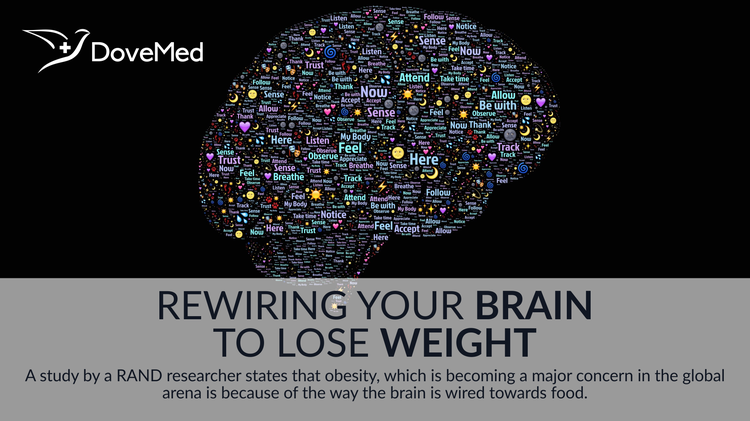 A study by a RAND researcher states that obesity which is becoming a major concern in the global arena is because of the way the brain is wired towards food. To rewire the brain in order to have healthy food and drinks, one must eliminate the need for processed juices, sodas, and such beverages. This could be substituted with green tea and water. The more and more people stock healthy foods in their fridge, the healthier they tend to be. This is also a part of rewiring the brain, as the more people associate themselves with healthy food items, the more they can tune themselves to control their weight or lose their weight, if so required. Protein intake is mandatory when it comes to losing weight. To rewire the human brain, consumption of an ideal breakfast is very important. Instead of having protein in every meal, have proteins for breakfast. Waking up to eating healthy proteins, like nuts, eggs, seeds, nut butters, and protein shakes, would help lose weight and curb cravings. The American Journal of Epidemiology informs that there is a strong relationship between eating habits and obesity. Breakfast skipping, eating away from home for long periods of time, and eating frequently during the day are all factors linked with obesity. Though it may not be an easy task to avoid binge eating for some individuals, studies point out that emotional eating is related to the brain. Arden, J. B. (2010). Rewire your brain: Think your way to a better life. John Wiley & Sons. Graham, L. (2013). Bouncing back: Rewiring your brain for maximum resilience and well-being. New World Library. Arden, J. B. (2012). AARP rewire your brain: Think your way to a better life. John Wiley & Sons.